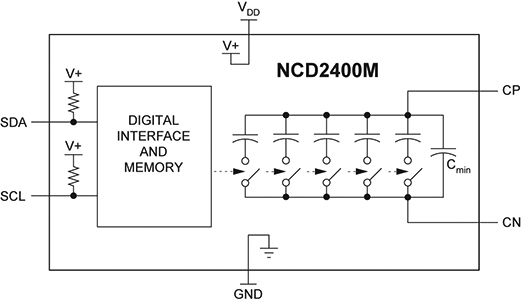 NCD2400M (Data Sheet Rev. 1) The NCD2400M is a dedicated electronic calibrator for oscillators, with reliable performance at 105ºC as required by OCXO applications. This product can be used in series or shunt configuration, to support a wide variety of tuning circuit topologies. 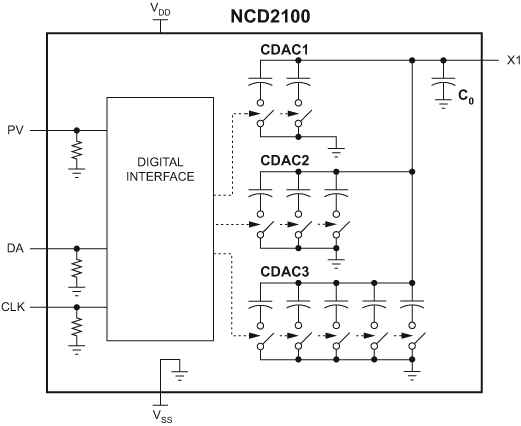 Digitally controlled capacitance trimming information is communicated via a 2-wire (I2C compatible) interface. The calibration value can be stored in the internal, re-programmable, non-volatile memory. non-volatile EEPROM register value or implementing on demand capacitance value changes are easily accomplished by means of the simple two-wire serial bus.